Every now and then a really fantastic parenting publication pops up, THE WHOLE-BRAIN CHILD WORKBOOK, a companion to the New York Times bestselling book of the same title is one of those. Internationally acclaimed neuropsychiatrist Daniel J. Siegel, M.D. and brain-based parenting expert Tina Payne Bryson, Ph.D. have createda workbook to help parents understand the science behind their child’s developing mind and survive theeveryday parenting struggles that accompany each stage of growth.The Whole-Brain Child Workbook contains dozen of practical age-specific exercises and activities to address today’s parenting conflicts: siblings, screen time, homework, and so much more. It’s a workbook, so there are places for parents/guardians to answer questions, problem-solve ideas, and more. This can be accomplished in a group setting (hey–why not organize a summer parent discussion group), on your own in small increments each day, or as an ambitious direct read-thru. I really loved the simple language, the pen-and-line drawings, and practical tips. [Excerpted from The Whole-Brain Child Workbook by Daniel Siegel, M.D., and Tina Payne Bryson, Ph.D., Ó PESI Publishing, 2015]. Reduces power struggles and encourages cooperation! Of course we all have busy lives, and responsibilities outside of family time are often very important. But if you ever feel like the bulk of your time with your kids is spent correcting behavior – or just “managing” them until you can make it to bedtime – stop and ask yourself, “How much fun are we having together as a family”? If the answer to that falls into the category of “not enough,” how do you think you could be more intentional about enjoying your time with your kids? What could you do so that having fun with them is at the front of your awareness more often? Now think about that question from the perspective of your kids. What do you think they would say about how they feel about family time? Would they say they got a boost of dopamine – a sense of excitement, pleasure, or interest – when the family is together? Do they get excited about family time? Do you think they’d say that there’s more tension and fighting than fun? Will they grow up knowing that, even though no one was perfect and even though there was conflict at times, you had plenty of fun together as a family? Remember, family fun doesn’t mean only big events. Bedtime snuggles, fort building, even laughing at corny jokes together can all be moments that bring your family together and help your children build those relationship skills we mentioned earlier. …And now for the give-a-way: for a chance to WIN a FREE copy of THE WHOLE-BRAIN CHILD WORKBOOK, send me a comment here on the blog, or email (leslie_lindsay@hotmail.com) indicating you shared this post via social media. All you have to say is, “I Shared!” That’s it. Name will be chosen by random on 6.30.15. Open to U.S. residents only. You will be contacted via email if you are the winner. Kindly check (and respond promptly) to your junk/other/spam folder should my message end up there. Daniel J. Siegel, M.D., is a graduate of Harvard Medical School and completed his postgraduate medicaal education at UCLA with training in pediatrics and child, adolescent, and adult psychiatry. He is currently a clinical professor ofpsychiatry at the UCLA School of Medicine, founding co-director of UCLA’s Mindful Awareness Research Center, coinvestigator at the UCLA Center for Culture, Brain and Development, and executive director of the Mindsight Institute. Dr. Siegel’s psychotherapy practice spans 25 years and he has published extensively for the professional audience. Dr.Siegel’s books include three New York Times bestsellers: Brainstorm, The Whole-Brain Child (with Tina Payne Bryson,Ph.D. ), and his latest No-Drama Discipline (with Tina Payne Bryson, Ph.D.), along with Mindsight; Pocket Guide to Interpersonal Neurobiology; The Developing Mind, Second Edition; The Mindful Therapist; The Mindful Brain; andParenting from the Inside Out (with Mary Hartzell, M.Ed.). He has been invited to lecture for the King of Thailand, Pope John Paul II, His Holiness the Dalai Lama, Google University, and TEDx. He lives in Los Angeles with his wife and two children. For more information about his educational programs and resources, please visit drdansiegel.com. Tina Payne Bryson, Ph.D.,is the co-author (with Dan Siegel) of two New York Times Best Sellers: The Whole-BrainChild and No-Drama Discipline. She is a pediatric and adolescent psychotherapist, the Director of Parenting for the Mindsight Institute, and the Child Development Specialist at Saint Mark’s School in Altadena, CA. She keynotes conferences and conducts workshops for parents, educators, and clinicians all over the world. Dr. Bryson earned her Ph.D. from the University of Southern California, where her research explored attachment science, childrearing theory, and the emerging field of interpersonal neurobiology. You can learn more about her at TinaBryson.com, where you can subscribe to her blog and read her articles about kids and parenting. raising a bright, beautiful, super-creative 10 year old daughter addled with distractibility, impulsivity, skinned knees, and an aptitude for art. And once upon a time, back when I didn’t bear the scars of childbirth and motherhood, I worked in child/adolescent psychiatry where I saw, first-hand, the manifestations of AD/HD in both girls and boys. Today, I am completely honored to have the *definitive* experts on girls and AD/HD. A hearty welcome to Drs. Nadeau, Littman, and Quinn! L.L. : Thank you so very much for being with us today. I so enjoyed UNDERSTANDING GIRLS WITH AD/HD: How they feel & why they do what they do. In fact, I breezed through as though reading a novel because it was *that* engrossing. This is a revised and updated edition—and I have to say—well done! What, in your opinion makes this an updated version? What do you hope readers glean? 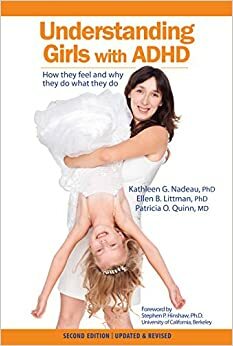 Patricia Quinn: When the first edition of Understanding Girls with ADHD was published in 1999, little research had been done that included girls with ADHD and the research that had been done certainly did not look at gender differences in ADHD. At that time, we wrote from our combined clinical experiences to address this need. This second edition includes the research that has been done to date and not only validates what we had voiced earlier, but also calls attention to recently uncovered issues for girls with impulsive behaviors, such as eating disorders and self-injurious behaviors. This edition focuses to a much greater extent on what parents can do to prevent such fall-out and help their daughters who have been suffering. Kathleen Nadeau: While parents and teachers can make a positive (or negative!) difference in the lives of girls with ADHD, ADHD is clearly a well-documented neurodevelopmental condition. In fact, there is more research on ADHD than on any other psychiatric disorder that occurs in childhood. There are documented differences in brain structure, in levels of brain activity in particular parts of the brain, differences in brain wave activity, and differences in neurotransmitter activity. The public has a reason to be skeptical, however, as ADHD diagnoses have exploded in some areas of the country, while remaining much lower in other areas, suggesting that factors other than ADHD itself can lead to more diagnoses in certain areas. Overall, however, statistics show that ADHD continues to be under-diagnosed in light of studies showing that up to 8% of the childhood population qualifies for an ADHD diagnosis. Parents should also realize that an ADHD diagnosis doesn’t mean automatically putting a child on medication. There are many things that parents can and should do to help their daughter with ADHD aside from medication. L.L. : Your ability to blend research with the real-world of raising girls is to be applauded. Sure, the stats are sobering, but it’s not all gloom and doom. What are some of the most powerful, most vital thing(s) parents/caregivers/teachers can do to help their daughters/students be the best they can be? Kathleen Nadeau: At home and at school, girls with ADHD thrive on structure and support. We work to teach parents how to provide a more structured ADHD-friendly home life – much has been written in our book about the types of support that girls need at each stage from preschool through high school. Teachers also need to recognize and support girls with ADHD who may look very different from the “typical” ADHD student that most teachers have come to expect. Girls struggle with tremendous anxiety because they have difficulty keeping up with assignments along with the many after-school activities that so many students participate in today. The more teachers and parents can work as a team to reduce stress and provide support, the better off girls with ADHD will be. We also teach parents the importance of adequate sleep, protein-rich nutrition that can provide fuel for the brain throughout the day, good nutrition including B vitamins and fish oil that support good brain functioning, stress management (stress can worsen ADHD), and daily aerobic exercise (aerobic exercise puts the brain in an optimal learning ready state). L.L. : Where do you think the future of AD/HD research is headed? Kathleen Nadeau: I believe that our understanding of this syndrome that we currently call ADHD will continue to evolve. Even now, there is a growing emphasis on seeing ADHD as a disorder of executive functioning – which is a far cry from the hyperactivity/impulsivity image of 20-30 years ago. Research has recently begun to be published about treating ADHD with nutritional supplements, something that has been emphasized by nutritionists for years, but that is now being documented by research. Another fascinating approach is the research on using mindfulness meditation to reduce ADHD symptoms. Lastly, my hope is that we begin to see what we now call a “disorder” as a type of brain with not only areas of weakness (the executive functions), but also areas of strength. There is a small body of research – much more is needed – showing that those with ADHD perform much better than average on a broad range of measures of creativity – showing that these brains that have so much difficulty staying focused on a single thing, may have a great gift in connecting many disparate ideas. L.L. : What are some of your favorite parent-friendly resources for managing AD/HD as well as supporting that bumpy ride? Patricia Quinn: To smooth out the ride at home, I am a great proponent of holding weekly family meetings and having stress-free, fun outings together. Both can go a long way to resolving issues and improving family cooperation. 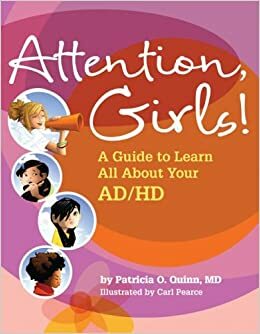 I also like to offer books for girls to read on their ADHD and have written a book for the 8- to 12-year-old girls called, Attention, Girls! A Guide to Learn All About Your ADHD. In it they not only learn about their ADHD, but also find ways to deal with it. Girls should also be encouraged to read about other topics that may be bothering them (such as anxiety, making friends, handling anger, etc.) or on finding ways to practice mindfulness and relaxation techniques. Magination Press has many great books for children that deal with these areas on their website. L.L. : What have forgotten to ask about that I should have? Kathleen Nadeau: We haven’t talked about the dangers of girls growing up with undiagnosed, untreated ADHD. While many used to think that girls had a “paler” version of ADHD because they tended to be less difficult and disruptive, we now know that girls are at a greater risk than boys of developing significant psychiatric disorders, making suicide attempts, and undergoing psychiatric hospitalizations than are boys. It’s important that we understand the risks, and how these risks can be greatly reduced by understanding these girls and providing the with the support, encouragement and treatment that can help them to reach their potential and grow up with their self-esteem intact. L.L. : Thank you for such an insightful resource and a wonderful interview. Kathleen Nadeau: Thank you, Leslie! Kathleen Nadeau, Ph.D. is a clinical psychologist that has specialized in the diagnosis and treatment of ADHD for most of her career. She is a popular speaker on ADHD-related topics both nationally and internationally and is the author of over a dozen books on ADHD-related topics. Dr. Nadeau received the CHADD ADD Hall of Fame Award in 2000 for her work focused on women and girls with ADHD. She is the director of the Chesapeake ADHD Center in Silver Spring, Maryland, just outside of Washington, DC, where she continues in clinical practice. Patricia O. Quinn, MD Dr. Quinn, a developmental pediatrician, is a well-known international expert and speaker on the topic of ADHD. For the last two decades, she has devoted her attention professionally to the issues confronting girls and women with ADHD, as well as high school and college students with disorder. In addition, she has authored several bestselling and groundbreaking books on the topic, including Understanding Girls with ADHD, 100 Questions and Answers about ADHD in Women and Girls, and Attention, Girls! A Guide to Learn All about Your ADHD. Her book, ADHD and the College Student: The Everything Guide to Your Most Urgent Questions, was released in May 2012. In 2000, Dr. Quinn received the CHADD Hall of Fame Award for her work in these areas.